Training older dogs is more time-consuming, and often more challenging, than training a puppy – but it’s definitely do-able! The old adage that says ‘You can’t teach an old dog new tricks’ is most definitely NOT true. Not even close. Most senior dogs can master the basics of obedience, social behavior and housebreaking given time, plenty of practice and a ‘teacher’ (you!) who is patient and kind. The biggest difference between training a pup and training an adult dog is that the younger one is pretty much a ‘blank slate’ and at an age where his brain is designed to soak up knowledge and experiences. Depending on where (or how) he spent his younger years, a mature or elderly dog may already have learned some bad habits, or not learned the good ones early on. So there could be an extra layer of UN-learning to be done as well. His brain is also not primed for learning the way a pup’s brain is, but that doesn’t make him ‘slow or stupid’. If you’ve owned your ‘oldie’ since he was a pup but up until now his training experiences have been negligible, at least you’re ahead of the game in that you know what he’s been through in his life and how he normally behaves. 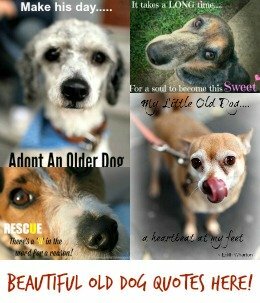 When you adopt a senior dog, or bring an adult or older dog into your life from another home/situation, sometimes the background info. you have is patchy at best. So, let’s take a look at what you can expect when training older dogs, and how to get the best results for your efforts. Although this is one of the aspects of training adult dogs which causes the most frustrations, and can be the most challenging, there is a simple method that works for almost all dogs. It’s impossible to make very generalized statements about the time housebreaking an older dog might take because there are so many variables involved. Any one of these, or combination of them, can make a difference to how quickly Fido picks up on what you expect from him, and how capable he is of acting on those expectations. The very best option for housebreaking an adult dog is to use a crate. It’almost like having a magic wand! Most dogs (even those who haven’t been crated before) adjust to the idea very quickly. Barring incontinence issues, mature dogs have the benefit of good bladder/bowel control and this, combined with the crate, really speeds up the potty training process. Click here to get all the practical advice and proven tips you need to crate train your older dog. Sadly, some senior dogs have been neglected and unloved for most of their lives, before finding their way into shelters or rescues…. and eventually (if they’re lucky) into loving homes. If your older dog is one of these he may not even know what it’s like to have a name, to wear a collar, or to be inside a warm, cozy house. Others have had a better life, but have never been given the chance to learn commands or master basic skills. Either way, training older dogs often means that you’re starting from scratch, so it’s important to keep you expectations realistic. Just because he’s a ‘big boy’, that doesn’t mean he automatically understands even the most basic commands such as ‘no’, ‘come’ or ‘sit’. Or that he has a clue how to walk nicely on a leash. Patience, kindness, consistency… and more patience… will help you ease your senior dog along the path of understanding. I promise you, it will be more than worth the effort involved. Socialization is the act of teaching your dog how to behave in different environments, and around other people and animals. It’s a vital skill, and NOT learning it early on can really impact a dog’s quality of life. ‘Socializing’ is best done with puppies, and then continued throughout their lifetime. Obviously as you’re here, your dog is no longer a puppy – so this is a more tricky proposition, but in many cases still very do-able. It’s all a matter of taking it slow and adapting to suit your dogs personality and abilities. A lot depends on your individual dog’s personality and temperament. Some dogs take to new things and experiences like ducks to water, others fight them every step of the way. It’s up to you to pick suitable activities and experiences, and to introduce them at the right pace for your dog. 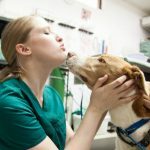 There are tons of ways to socialize your dog, and as well as being very important to his well-being, it can be a lot of fun and a great way to strengthen the bond between you. BUT, some older dogs are just too scared, anxious, defensive or protective, to learn new social behaviors easily. If your senior dog gets very upset when you put him in new situations, or reacts aggressively around other people or pets, then your best bet is to find a professional who can help you. A certified and experienced dog trainer, or dog behaviorist, can evaluate Fido and advise you on how best to handle his social issues. Never force a dog into situations that clearly terrify him, or put other people or pets at risk by introducing a dog with reactive, defensive or aggressive behavior. An older dog who has been in a rescue or pound situation for more than a day or two will most likely have been assessed by shelter staff and they will be able to tell you how he reacts to other dogs, people and so on. Kids, cats and outside environments may be an unknown, and it will be up to you to introduce those slowly and carefully. 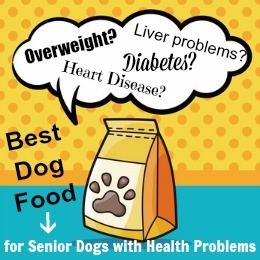 Behavior problems come in all shapes and sizes, and with older dogs bad habits are often part of the package. Things like chasing cats, barking at strangers, snatching treats, guarding toys/food, stealing tidbits, begging, jumping…. the list goes on and on. Of course, these are pretty common behaviors in puppies and dogs of all ages! Just like with every other aspect of training older dogs, the key to success is to be patient and consistent. If Fido has spent 8 years perfecting the art of hogging the sofa or throwing himself at anyone who comes through the front door, it’s going to take more than a week or two for him to UN-learn those bad habits. But, dogs are incredibly eager to please the people who love them, and mature and older dogs can be a much ‘quicker-study’ than you might expect. As long as you clearly show your older dog what you want from him, and lovingly and patiently help him to shape his behavior to fit those wants, he will gradually forget the bad behaviors and start using the new – much better – ones. I appreciate you helping me learn more about training older dogs. I am so happy for the attention that is being given to these older dogs and that there’s still place for them. A place where they are still useful. We have an old dog and we love her that much.